The original goal of these experiments was to provide a reliable storage solution for older computers which usually weren't used much. PATA drives are still available, but are essentially obsolete. Older machines with PATA drives are having drive failures and the options were replace with a new PATA drive or look into CF card use. IDE to CF adapters are pretty straightforward and are more or less straight through adapters to CF, so the limiting factor in performance should be your CF card. The flash in CF cards have a limited number of write cycles, so the CF cards will fail eventually. However, the intended use here is for machines infrequently used, so this is not a problem for my particular use case. Additionally, flash card sizes are small enough that imaging them and saving off to a modern storage solution is trivial, as is restoring them. Before getting into the details of card use, a few comments are in order. After using CF cards in a number of machines now, I would not recommend them for regular use. On essentially every machine I've tried with different brands of adapters and cards, I have noticed stuttering. The disk access will apparently hang for a second or so, with no apparent progress. The best explaination I have heard for this is the card's wear leveling is kicking in. This is usually a minor annoyance with more robust IDE controllers and drivers, however some systems don't deal so well with the device "locking up" for short periods. 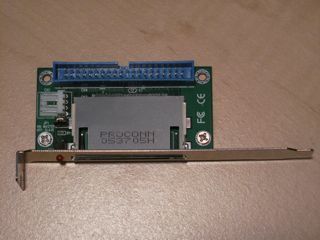 I've used several different types of IDE-CF adapters at this point, including the Syba SY-IDE2CF-NB25 which is a 2.5" 44pin adapter, a 40pin male connector Syba adapter, and several generic brands purchased off ebay. Since the adapter is essentially a passthrough device, I haven't seen any differences in behavior between the different adapters. However, when purchasing adapters, there are a lot of choices. 40pin adapters tend to use female connectors for plugging straight into a motherboard connector. This precludes the use of a second device on the bus (like an optical drive). 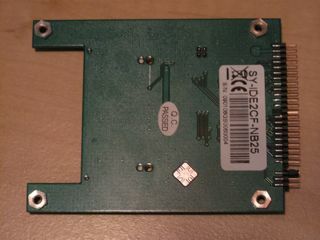 This can also have mechanical problems if there is insufficient room around the motherboard IDE connector. 40pin male connectors allow the use of a traditional IDE cable, and are readily available but somewhat less common than the female connectors. 40pin adapters require a power source, and due to space constraints most use a floppy power connector. Keep this in mind, as floppy power connectors on power supplies are becoming less common and often are not the desired length. 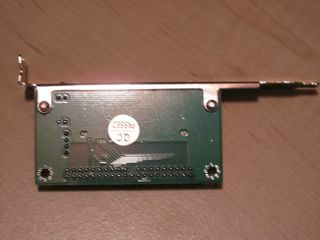 Some 40pin adapters allow powering off the 40pin PATA connector. I personally have not had luck doing this and always require an power connector. 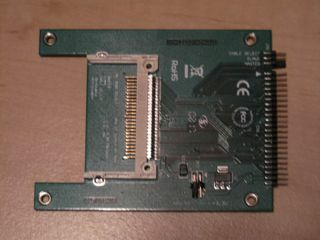 Experiments with the R-IDSC-E/R SCSI to IDE adapter are documented here, but the summary is: most cards work pretty well. An additional side note on CF cards. Some IDE controllers require UDMA to function properly. Most CF cards (none of the ones I've tested with) support UDMA. Some higher end ~300x CF cards do support UDMA and will likely have better compatibility results than what I've tried. They're also much faster.